station is directly at the Mergellina harbor. Before the great age of people-moving gizmos such as lifts, escalators, and transporter beams, our species regularly depended on now largely vestigial appendages (called "legs") to climb a series of flat-topped structures placed in succession at ever higher increments in order to facilitate movement from "down here" to "up there". These were called "steps" or "stairs. This may seem cruel to those of you who routinely whine about having to hike all the way to the curb from where you have just double-parked, but they were cruel times. Because of the way Naples spread over the centuries from sea-level to 600 feet on the Vomero and Posillipo hills, Neapolitans depended on an extensive web of stairways throughout the city. But when funicular railways ("cable cars") came in in the late 1800s, legs and stairs went out, and many of the long flights of stairs are in now poor repair and, indeed in some places, overgrown and practically impassable. Neapolitans now rely on the existence of four cable-cars in the city. (1) The Mergellina cable car (bottom station, photo, right, opened in 1931) runs from the harbor of Mergellina, making a number of stops before reaching the top station on via Manzoni, the road that runs along the very top of the Posillipo ridge. Of the four cable-cars in Naples, this is the only private one. It is reliable and usually in good working order. Because of the location, the Mergellina cable-car does not carry as much traffic as any of the others though it does provide a valuable service to the people in that area. (2) The Chiaia cable-car (opened in 1889). This was the first cable-car in the city. (Construction site photo at top of page, from 2002, shows the Parco Margherita station. 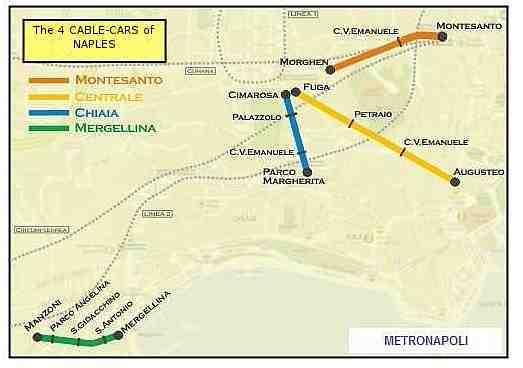 (Update: 2013) The new, re-opened top and bottom stations, Parco Margherita and Cimarosa, are shown in photos below). This line was in and out of service for 20 years, from the 1980s, when they decided to rebuild it, to 2004. (The title of this page and the lead paragraphs reflect my frustration at the time. I left in the original photograph of the construction site because I am just plain mean!) In a related entry, I heaped every heapable insult upon the so-called heads of the so-called architects of the original plan to build a Brutalist monstrosity. In any event, there was a law suit and construction was stopped for years; the law suit was settled (that is, compensation was rendered unto those whose optic nerves had been permanently damaged from the mere sight of the Metal Thing from Planet Puke) and construction went ahead in full swing (Count Basie would have been proud). By 2004, the cable car was functioning, even though none of the stations were really completed. The line essential for people who have to get from the busy shopping district of Chiaia to the businesses, residences and new metro connections 200 meters up on the Vomero hill. The first stone of construction was laid in the presence of king Umberto, whose spent a lot of time in Naples. (He had been there the year before during the great cholera epidemic, where his behavior had endeared him to the populace.) The line is 538 meters long and climbs 161 meters in elevation at a gradient of 29%. Each trip can move 300 passenger and the daily capacity of 12,500. It is an easy four-minute ride when the cable-car is running. When it is NOT running, the city runs extra buses. The bus trip is a disaster and, depending on traffic, can range from 20 minutes to Please, God, Why Was I Born. If the Evil Architects (EA's) had won the Battle of Parco Margherita (the bottom station), that entire station would have wound up looking like what you see here (photo, above, left). 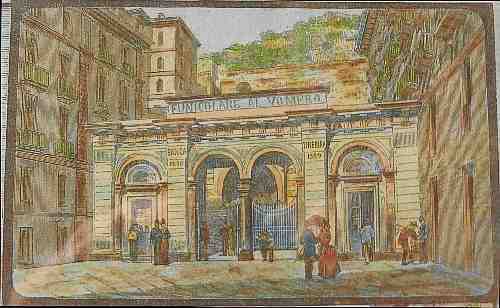 This is the entrance to the intermediate station of the Chiaia line at Corso Vittorio Emanuele. Here, clearly, the EA's eeked out a minor victory and may they rot in hell; very few people actually use this station, so we can overlook it. Basically, it consists of a couple of girders with a door hanging off the bottom. That is what the residents in the buildings adjacent to the construction site at Parco Margherita were protesting against. Now they have an aesthetic piece of retro architecture (photo, below, left). Central line, bottom station, via Toledo (via Roma), downtown. (3) The Central cable car opened in 1928 was built to handle the increasing need for rapid transport between the downtown business areas and the rapidly growing center of urban population, the Vomero hill above Naples. That need was only partially met by the earlier two lines, Chiaia and Montesanto; "central" was an apt name for this new line in that it is about equidistant between the other two. It is 1234 meters long and climbs at an average gradient of 12%; it can carry 450 passengers on its 4'20" express run (skipping the two intermediate stations between top and bottom). The central line can move over 6000 passengers an hour. It is the most important one in the city. The bottom station (Augusteo) (photo, above, right) is on via Toledo (alias via Roma), the busiest shopping street in the city, within easy walking distance of the San Carlo opera, the Galleria Umberto, the City Hall, the main Bank of Naples, the Port of Naples, and Piazza Plebiscito. This line closes rarely but regularly for scheduled repairs. 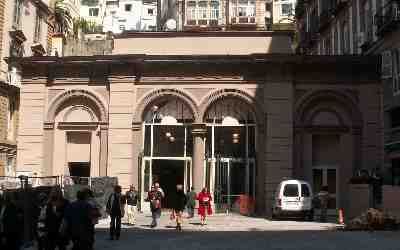 The bottom station is still housed in the original building, adjacent to the Augusteo Theater. The station was built to the design of archictects Armando Foschini and Pier Luigi Nervi. The new Central line went into construction in 1925 and lasted well into 1929, although it was officially opened earlier on October 28, 1928 to coincide with the 6th anniversary of Mussolini's March on Rome. The cable-car was, in that sense, very much a "regime" product (as were virtually all large construction projects of the late 20s and 30s in Italy). (4) (updated 2013) The Montesanto cable-car (separate item on bottom station here) opened in 1891 after five years of construction. It is 824 meters long; the average gradient is a steep 21%, and it takes 4'25" from bottom to top. The line can carry 300 passengers a trip (each train has three cars) and has a daily capacity of 11,000 passengers. 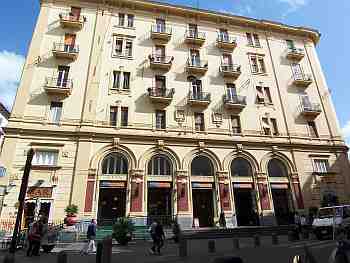 There is only one intermediate station, at Corso Vittorio Emanuele. From the top station on Vomero, near the Sant'Elmo castle, it runs right down into one of the most crowded parts of the city, not far from Piazza Dante. 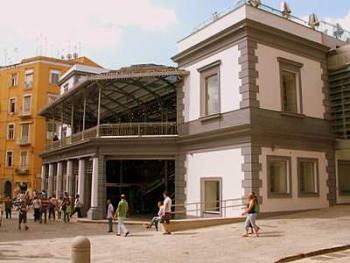 The bottom station is adjacent to one of the two important narrow-gauge railways in the city, the Cumana line, and near another station of the older Naples metropolitana. 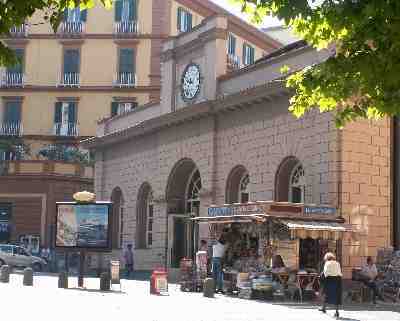 The bottom station (photo, left, below) was recently restored to its 1882 appearance; at that time, before the cable-car, the station served as the Naples terminus of the Cumana railway. The station has been declared a national monument. The top station was rebuilt in the 1990s to an unacceptable Brutalist building that I have elsewhere described as "Führerbunker Bauhaus". The station has since been been redone and is shown in the photo (below, right). When the cable-car is not working, the gap is partially filled by the metro station at Piazza Dante; that station has been open for a few years, and the new metro runs to Vomero in a short time. There is, as far as I can tell, still no progress on building a rather ingenious new intermediate station (described in this separate entry). What can I say? These things have their ups and downs.